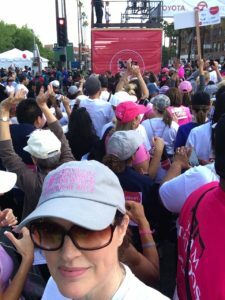 Back in 2010 I began walking in the Revlon RunWalk in LA. It was a wonderful experience for my family and myself. Unfortunately the five years I walked were the last five years of the event. In 2012 I was asked to write about my feelings regarding the walk and the following was sent to everyone on their mailing list. I give this to you, my readers, in honor of Breast Health Awareness Month. 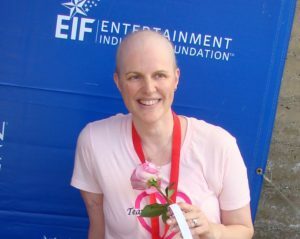 The first year I walked in the EIF Revlon Run/Walk, it was an end point to what had been the hardest year of my life. May 8, 2010 was exactly two months to the day of my final chemo treatment. I had to plan for the future. I needed a goal. To celebrate the end of chemo, I decided I would walk in theRun/Walk with the family and friends who helped me through it all. This got me out of bed when I was hurting, exhausted and nauseous. Every day I would walk. Some days I could only walk about 100 feet and then I would turn back. But each day I walked farther. The first time I walked, it was about getting there and doing it– completing the Run/Walk with my team was something I had dreamed about – I made it holding the hand of my just 8 year old daughter the whole way as my older daughter ran ahead. My team raised over $15,000. It is interesting to take this look back. I have come so far and I am forever grateful.